Somebody you know, somebody you love is in the crisis of their life. They need to know the information that we offer in this workshop. Please forward this information to your friends, your family, or your professional colleagues who are in crisis this minute. 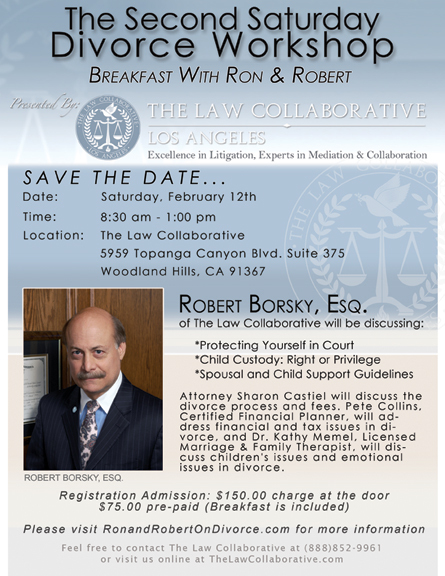 This Saturday, February 12, 2011, The Law Collaborative is hosting the Second Saturday Divorce Workshop at our office in Woodland Hills. Over breakfast and coffee, participants will hear from a veteran family law attorney, a financial expert, and a mental health professional. The setting is intimate, questions are answered, and concerns are addressed. Register today and receive 50% off the registration fee. To register online visit TheLawCollaborative.com or email your name, contact information, and payment information to Info@TheLawCollaborative.com. To register over the phone, call us toll free at (888) 852-9961. 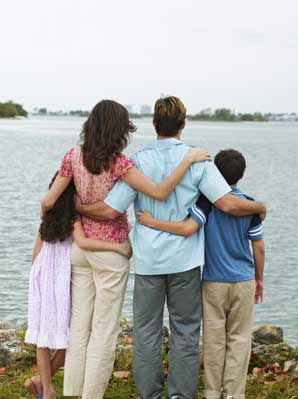 For more information about the Second Saturday Divorce Workshop, visit RonandRobertonDivorce.com. Somebody you know, somebody you love is in the crisis of their life. They need to know the information that we offer in this workshop. Please share this information with your friends, your family, your professional colleagues who are in crisis this minute. On the second Saturday of every month The Law Collaborative hosts a Divorce Workshop at our office in Woodland Hills. Over breakfast and coffee, participants hear from a veteran family law attorney, a financial expert, and a mental health professional. The setting is intimate, questions are answered, and concerns are addressed. Register today and receive 50% off the registration fee. To register online visit TheLawCollaborative.com/SecondSaturday.htm or email your name, contact information, and payment information to Info@TheLawCollaborative.com. To register over the phone, call us toll free at (888) 852-9961.